Greece The Rise of the City-State: Sparta - HISTORY'S HISTORIESYou are history. We are the future. Instructions: With this lesson you will create a chart that compares the daily life in Athens and Sparta. So that you can better identify the information you're looking for, please review the comparison chart in the activity before you begin reading your lesson. Use the icons that begin each section to help guide your chart completion. From a cultural perspective, Sparta was in many ways the opposite pole to Athens. In Sparta, their social structure, with military training at its core, allowed all Spartans some form of equality. While in Athens, civic participation was restricted to a small segment of society. Both daily life and education were very different in Sparta than they were in the other city-states. With the exception of the Athenians (who thought Athens was the best! ), Greeks from other city-states had a grudging admiration for the Spartans. Of course, they wouldn't want to be Spartans. In times of war, however, they most certainly wanted Sparta to be on their side. The Spartans, after all, were tough, and the ancient Greeks admired strength. What is the purpose or goal of Athenian education? Education: In ancient Athens, the purpose of education was to prepare citizens for both peace and war. In that way, Athenian education really wanted to produce citizens that were a reflection of Athens itself, people prepared to take part in the governance of the city-state. Girls were not educated at school, but many learned to read and write at home, in the comfort of their courtyard. Until age 6 or 7, boys were taught at home by their mother or by a male slave. From age 6 to 14, they went to a neighborhood primary school or to a private school. Books were very expensive and rare, so subjects were read out-loud, and the boys had to memorize everything. In primary school, they learned two important things - the words of Homer, a famous Greek epic poet, and how to play the lyre, a musical instrument. Brain Box: How did Athenian education prepare students for their roles in society? Their teacher, who was always a man, could choose what additional subjects he wanted to teach. He might choose to teach drama, public speaking, government, art, reading, writing, math, and another favorite ancient Greek instrument, the flute. Following that, boys attended a higher school for four more years. When they turned 18, they entered military school for two years. At age 20, they graduated. However, an Athenian citizen could be called into military service any time their city-state was threatened. What was the purpose or goal of Spartan education? Education: In ancient Sparta, the purpose of education was to produce a well drilled, well disciplined marching army. Spartans believed in a life of discipline, self-denial, and simplicity. They were very loyal to the state of Sparta. Every Spartan, male or female, was required to have a perfect body. When babies were born in ancient Sparta, Spartan soldiers would come by the house and check the baby. If the baby did not appear healthy and strong, the infant was taken away, and left to die on a hillside or trained as a slave (a helot). A baby who passed this examination was assigned membership in a brotherhood or sisterhood, usually the same one to which his father or her mother belonged. Spartan boys were sent to military school at age 6 or 7. They lived, trained and slept in the barracks of their brotherhood. At school, they were taught survival skills and other skills necessary to be a great soldier. School courses were very hard and often very painful. Although students were taught to read and write, those skills were not very important to the Spartans. Only warfare mattered, so most Spartans only needed enough reading skills to understand an officer's written order and to, unquestioningly, follow the order. During the time they were in school, the boys were not fed well, and were told that it was fine to steal food as long as they did not get caught. If they were caught, they were beaten. The boys marched without shoes to make them strong. It was a brutal training period. Brain Box: How did Spartan education prepare students for their role in society? Legend has it that a young Spartan boy once stole a live fox, planning to kill it and eat it. He noticed some Spartan soldiers approaching, and hid the fox beneath his shirt. When confronted, to avoid the punishment he would receive if caught stealing, he allowed the fox to chew into his stomach rather than confess that he had stolen a fox, and he did not allow his face or body to express his pain. Somewhere between the ages of 18-20, Spartan males had to pass a difficult test of fitness, military ability, and leadership skills. Any Spartan male who did not pass these examinations became a perioikos. (The perioikos, or the middle class, were allowed to own property and have business dealings, but they had no political rights and were not citizens.) If they passed, they became a full citizen and a Spartan soldier. Spartan citizens were not allowed to touch money. That was the job of the middle class. Spartan soldiers spent most of their lives with their fellow soldiers. They ate, slept, and continued to train in their brotherhood barracks. Even if they were married, they did not live with their wives and families. They lived in the barracks. Military service did not end until a Spartan male reached the age of 60. At age 60, a Spartan soldier could retire and live in their home with their family. A Spartan education consisted greatly of military training. Boys trained from the time they left home at the age of 6 or 7 until adulthood, at which time they began a lifetime of service to their city-state as a soldier. 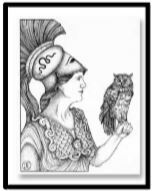 What freedoms did women have in Athenian and in Spartan society? Women: With the exception of ancient Sparta, Greek women had very limited freedom outside the home. In Athens, women could attend weddings, funerals, some religious festivals, and visit female neighbors. In their home, Greek women were in charge! Their job was to run the house and to bear children. Most Greek women did not do housework themselves. Female slaves cooked, cleaned, and worked in the fields. Male slaves watched the door, to make sure no one came in when the man of the house was away, except for female neighbors, and acted as tutors to the young male children. In Athens, as in most Greek city-states, with the exception of Sparta, girls stayed at home until they were married. Like their mother, they could attend certain festivals, funerals, and visit neighbors for brief periods of time. Their job was to help their mother, and to help in the fields or in the family business, if necessary. Opportunities for women in Athens and the role they played in Athenian society was limited. Women: In Sparta, girls also went to school at age 6 or 7. They lived, slept, and trained in their sisterhood's barracks. No one knows if their school was as cruel or as rugged as the boys’ school, but the girls were taught wrestling, gymnastics, and combat skills. Some historians believe the two schools were very similar, and that an attempt was made to train the girls as thoroughly as they trained the boys. In any case, the Spartans believed that strong young women would produce strong babies. At age 18, if a Spartan girl passed her skills and fitness test, she would be given all of the privileges of citizenship and assigned a husband, or she would choose one. She was then allowed to return home. If she failed, she would lose her rights as a citizen, and became a perioikos, a member of the middle class. In most of the other Greek city-states, women were required to stay inside their homes most of their lives. In Sparta, citizen women were free to move around, and enjoyed a great deal of freedom, as their husbands did not live at home. In ancient Athens, wedding ceremonies started after dark. The veiled bride traveled from her home to the home of the groom while standing in a chariot. Her family followed the chariot on foot, carrying the gifts. Friends of the bride and groom lit the way, carrying torches and playing music to scare away evil spirits. During the wedding ceremony, the bride would eat an apple, or another piece of fruit, to show that food and other basic needs would now come from her husband. Gifts to the new couple might include baskets, furniture, jewelry, mirrors, perfume, and vases filled with greenery. In ancient Sparta, the ceremony was very simple. After a tussle, to prove his superior strength, the groom would toss his bride over his shoulder and carry her off. Spartan men only married women who wanted to marry them. There were no forced marriages in Sparta, and no marriages created for social gain. Spartan men married for love. They chose a bride the same way they chose everything - as a teammate for life. What were the responsibilities of citizenship in Athens and in Sparta? In contrast to the spirit of individual expression so highly valued by the Athenians, ﻿Spartans believed in teamwork. You fought in teams, always aligned with a brother warrior so you always had someone to watch your back. To the Spartans, teaming up with another city-state was logical. Sparta teamed with different city-states at different times for different reasons. For all their warlike behavior and training, when a problem arose with another city-state, Sparta would first try to solve that problem though discussion and negotiation. If that failed, they would fight. Since they were legendary warriors, in most cases, the other Greek city-states worked out their differences with Sparta without going to war. No marvelous works of literature, art or architecture came out of Sparta, but Spartan military force was regarded as terrifying. Thus, the Spartans achieved their goal. “We know we are superior and we are delighted to be Spartan! 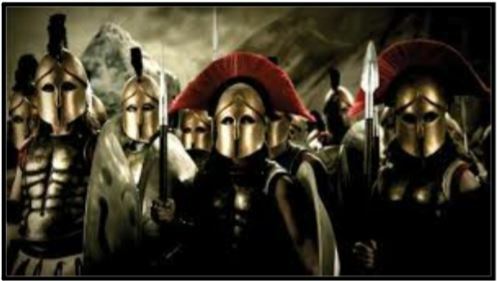 Lie, cheat, and steal, but do not get caught – that is the Spartan way.” (All the warriors nodded. These were wise words indeed.) “We endure unbelievable pain and hardship to become a superior Spartan soldier and citizen! Taken away from our parents at age 7, we live a harsh and often brutal life in the soldiers’ barracks. Older children start fights to help make us tough and strong and beat us. We are often whipped in front of groups of other Spartans, including our parents, but we never cry out in pain. We are given very little food. We are encouraged to steal food, instead. If caught stealing, we are beaten. To avoid severe pain, we learn to be cunning. We know how to lie, to cheat, and to steal, and we know how to get away with it! We are fierce, capable, and proud of our strength. Brain Box: What made Athenians and Spartans each most proud of their city-state? Athens, left, and Sparta, right, today.